Check out How to Make French Toast Restaurant Style by Huang Kitchen on Snapguide. 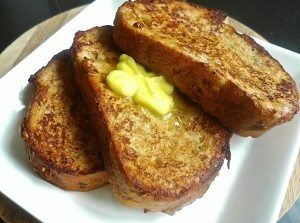 French toast, also known as eggy bread or gypsy toast is a dish of bread soaked in beaten egg batter, then fried and baked. As it is mostly bread, the kind of bread you use is important. Pick your favourite bread – White, Italian, French or Whole Wheat. Challah or egg bread will give incredibly creamy insides. 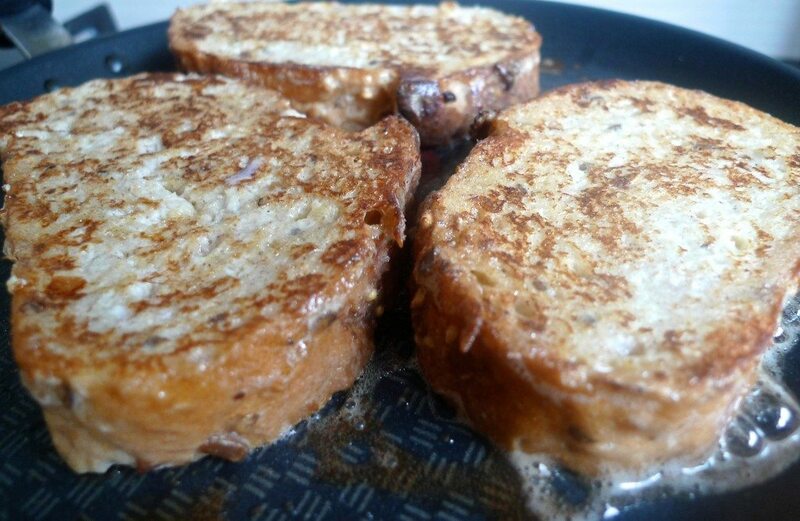 Country- style breads are great too, and will give a sturdier, less creamy French toast. Classic French baguette sliced diagonally make a nice, chewy version. Do avoid using white sandwich bread and rustic breads with large holes and thick crust as the rustic bread can’t hold the egg mixture and white bread is too soft. Also day-old or slightly stale bread is preferred for this recipe. 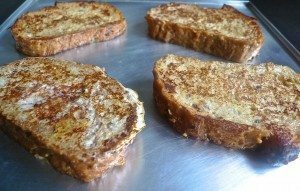 To make french toast, first cut the multigrain french bread into 6 thick slices. Measure ingredients needed to fry the bread. 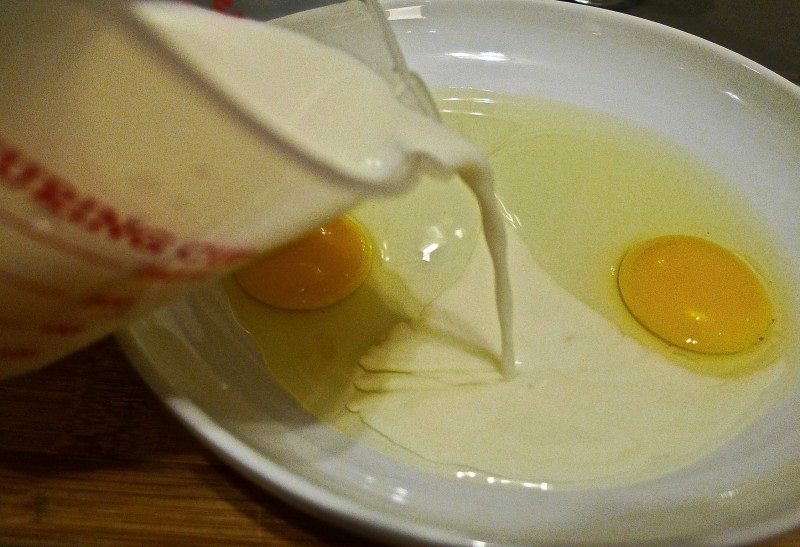 Place 2 eggs in a big shallow bowl. Add the milk. 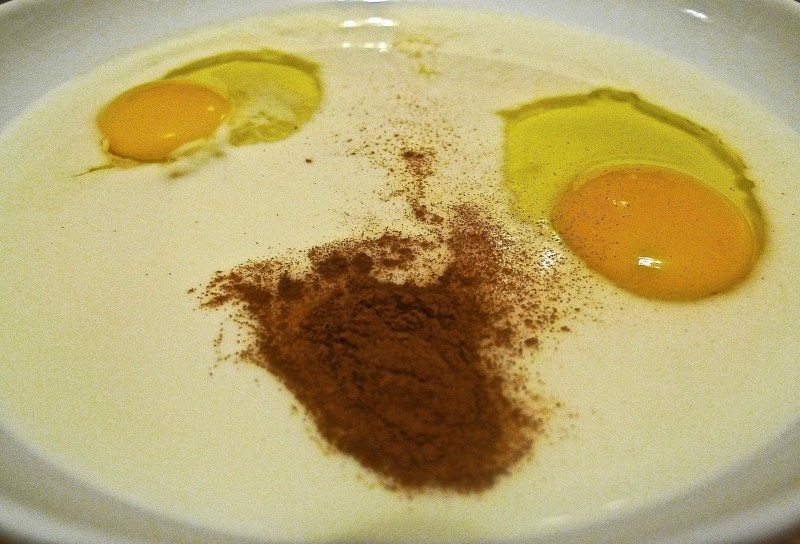 Then add the ground cinnamon and salt. Next add the brown sugar. Followed by vanilla extract. 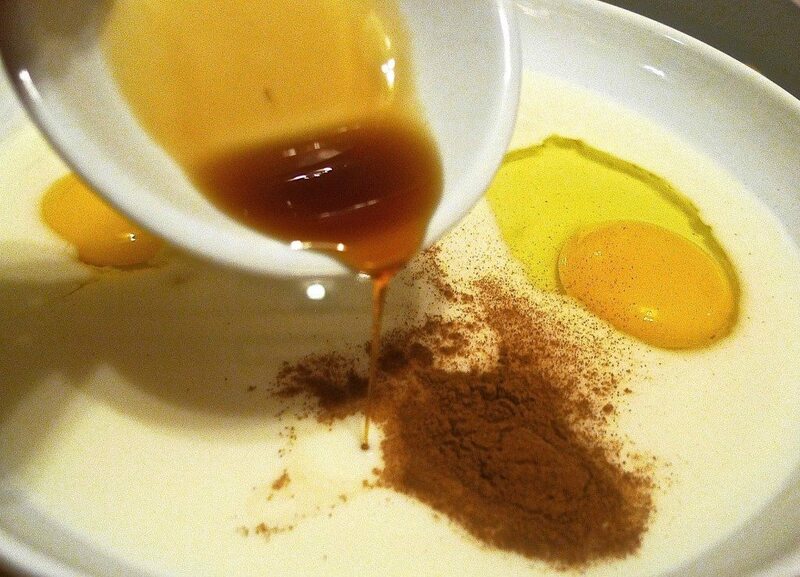 Whisk everything together in the shallow bowl. 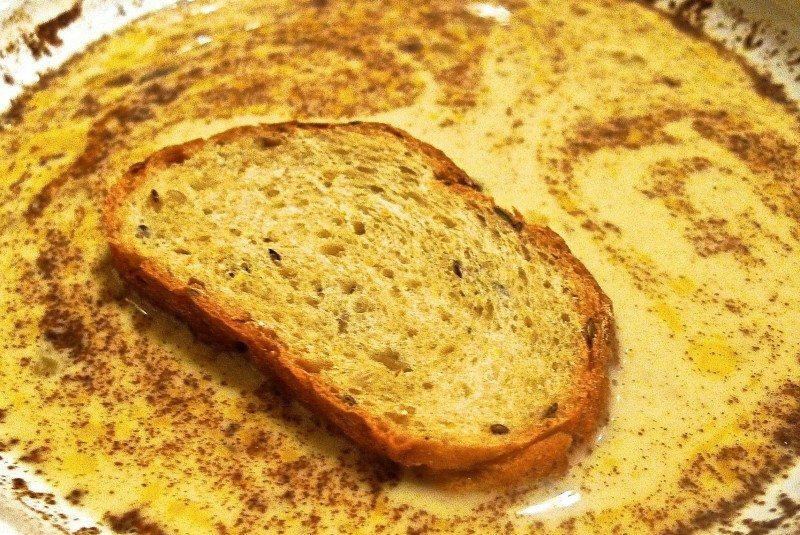 Dip each slice of thick french bread into the egg mixture. Soak the bread on both sides. Make sure the bread is completely soaked. Soak all the 6 slices of bread and drained. Place all the soaked slices of bread on a plate. (Optional): Set aside the soaked bread in the fridge for 10 minutes and resoaked before frying. 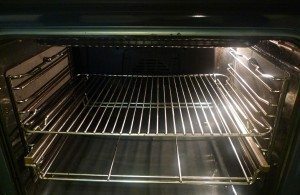 Preheat oven to 200 degree C (400 degree F). Working in batches, brown the bread very slightly until golden brown. Sauté for about 3 minutes, just to kind of seal the egg batter. Flip over and brown for another 3 minutes until it’s beautiful and golden brown. 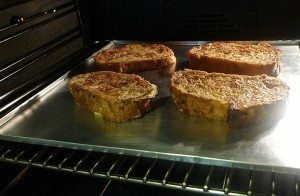 Transfer the golden brown slices of french bread to a baking sheet. 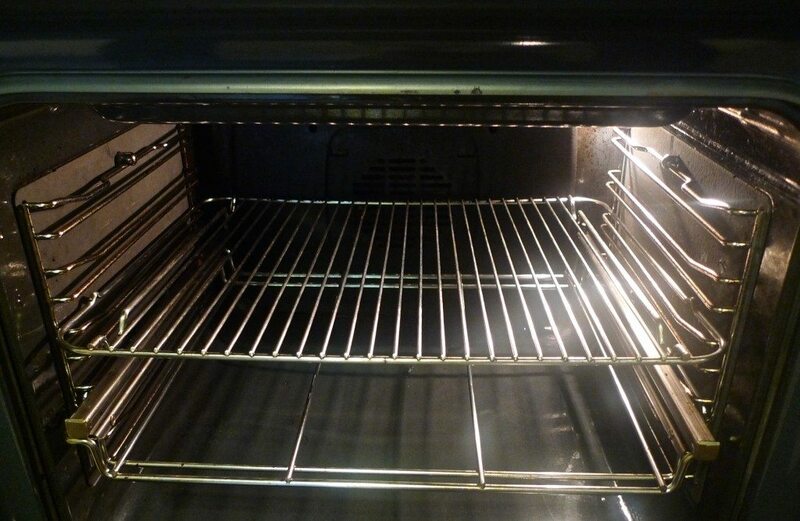 Then bake in the preheated oven for 12 to 15 minutes to finish the cooking. The bread will puff slightly and will be crispy on the outside while the inside will be incredibly moist and soft. 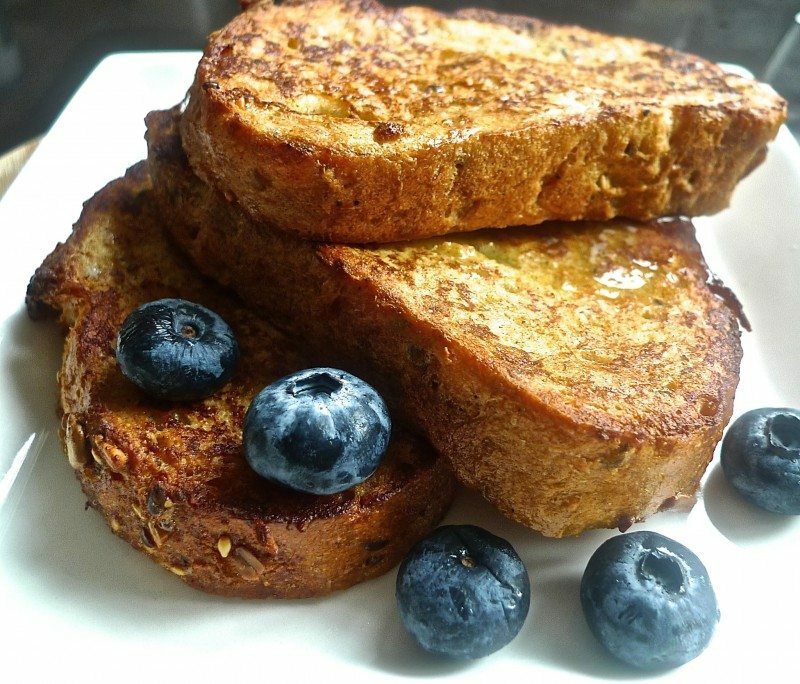 Keep the french toast warm in the oven over low temperature if not eaten right away. 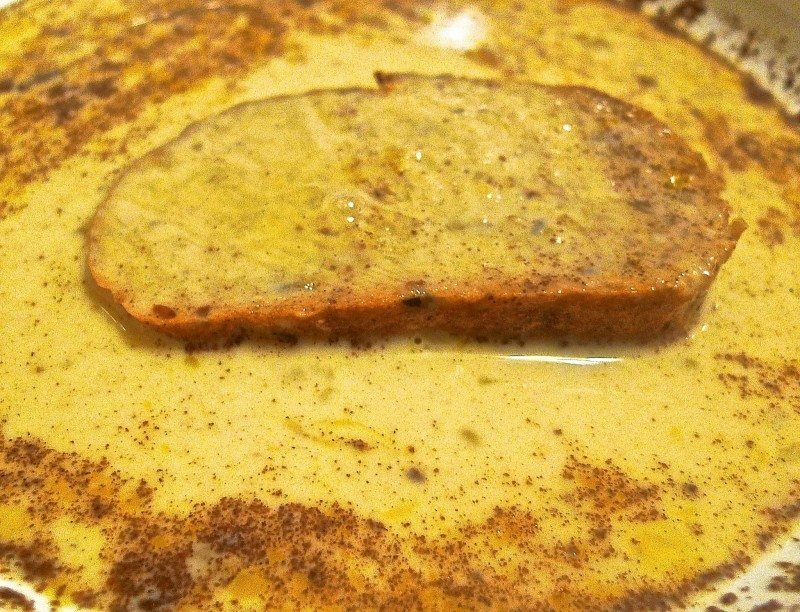 The baking cooks the custard inside the bread and gives it an unbelievable texture. The outside on the other hand is crispy and golden. This gives a truly amazing french toast experience. Preferably to use day-old or slightly stale bread – soak up more egg mixture without falling apart. 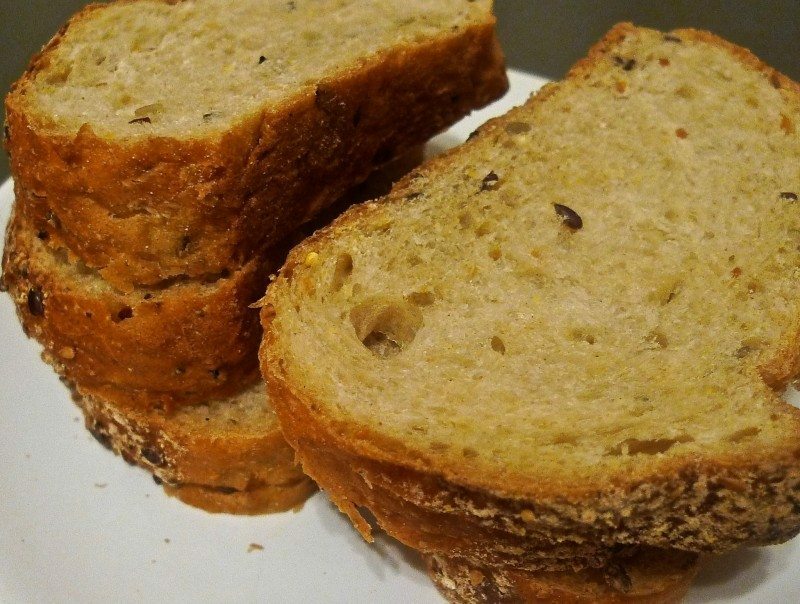 Cut the bread into thick slices, 1/2 to 3/4 inch thick – this helps to keep bread from becoming soggy while promoting a moist and creamy interior. 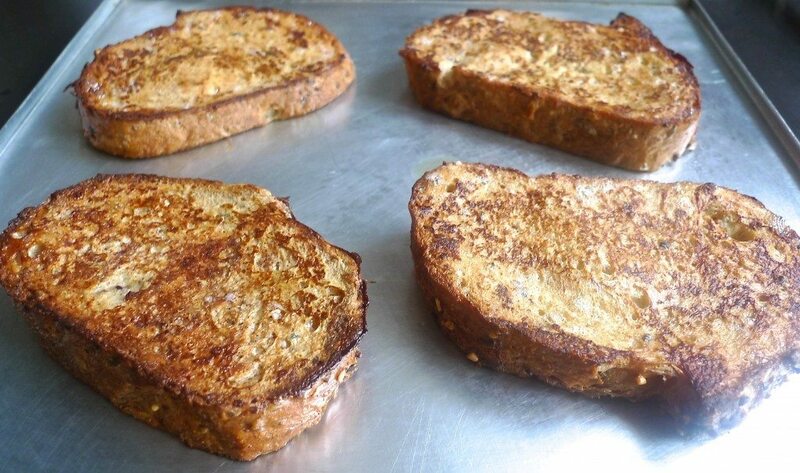 To make french toast, first cut the french bread into 6 thick slices. 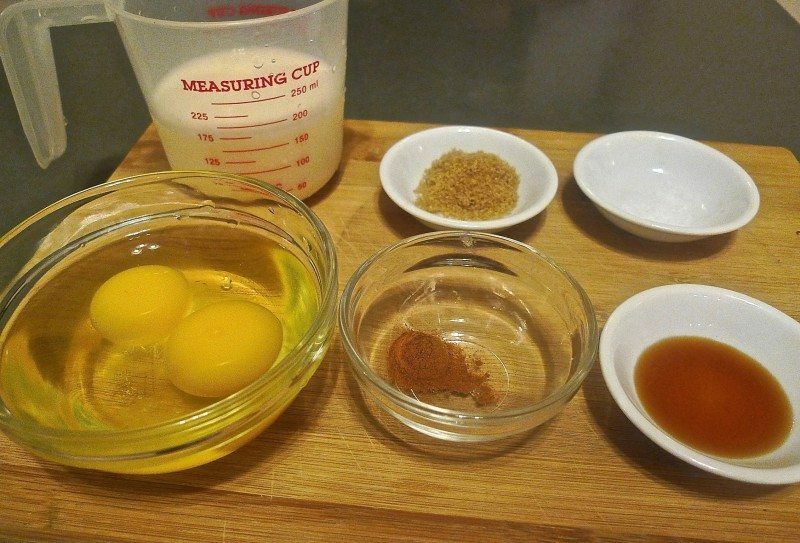 Measure all ingredients needed to make the french toast. 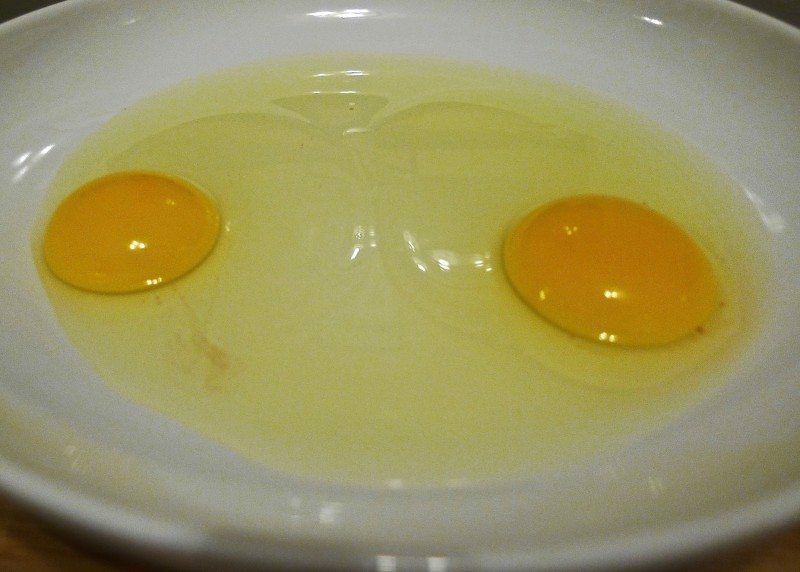 Place the 2 eggs in a big shallow bowl. 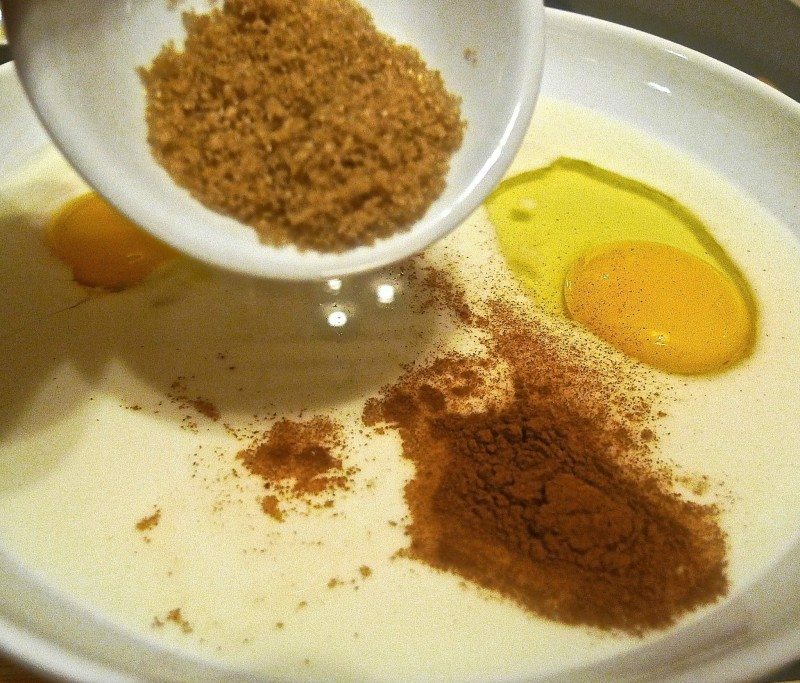 Then add ground cinnamon and salt. Next add the brown sugar. Soak all the 6 slices of bread, drained and set aside. 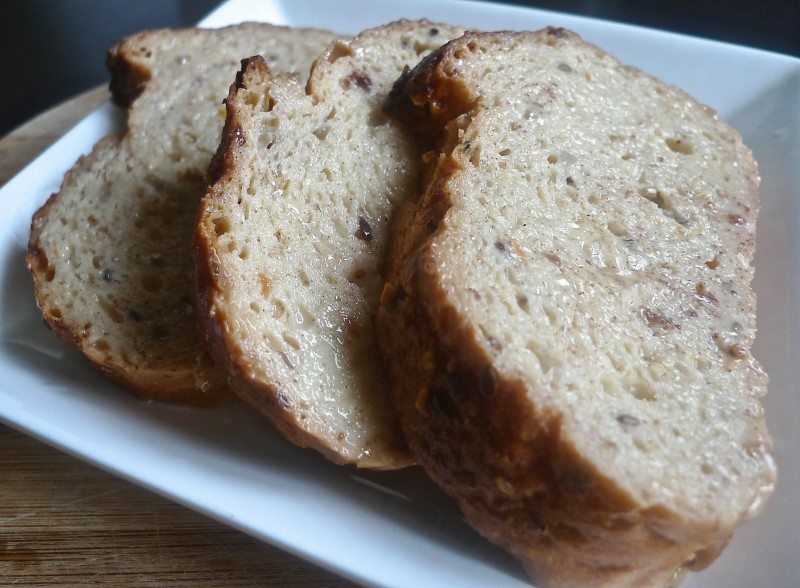 Place all soaked slices of bread on a plate and set aside. Working in batches, brown the bread very lightly until golden brown. Sauté for 3 minutes, just to kind of seal the egg batter. Flip over and brown for another 3 minutes until it’s beautiful and golden colour. 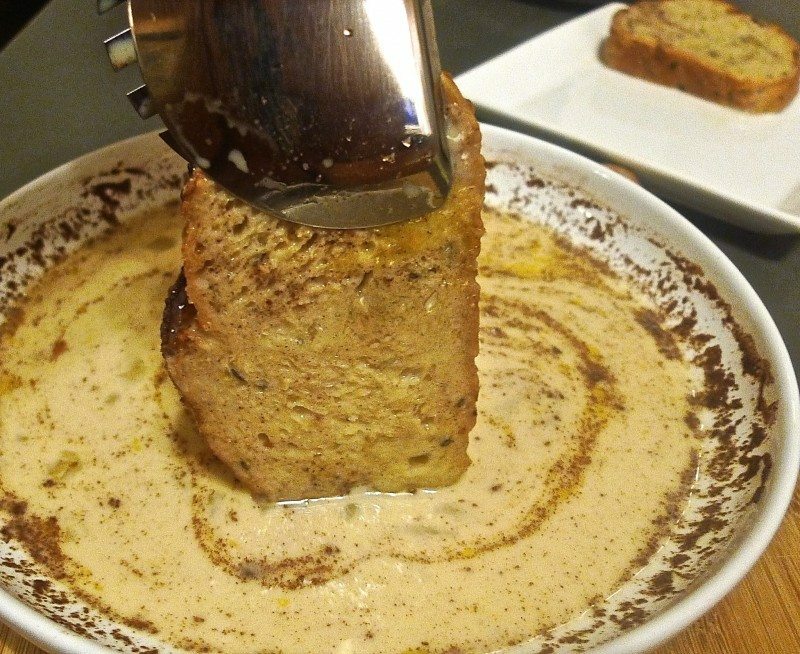 The baking cooks the custard inside the bread and gives it an unbelievable creamy texture. The outside on the other hand is crispy and golden. 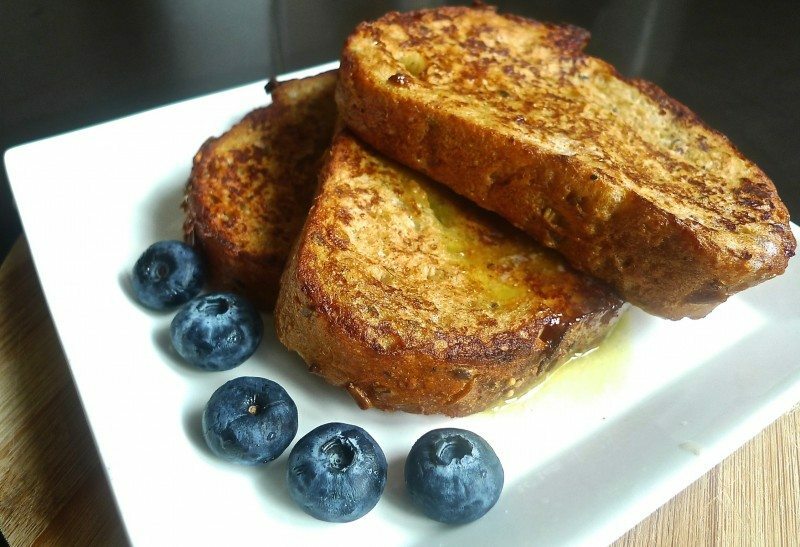 This gives a truly amazing french toast experience. Or serve with maple syrup and garnish with some blueberries .